It stopped raining just long enough to to take a few pictures of my finished table runner the other day. I found it very difficult to get pictures showing the true color of the hand dyed fabrics I used. This first one is the closest to being true. 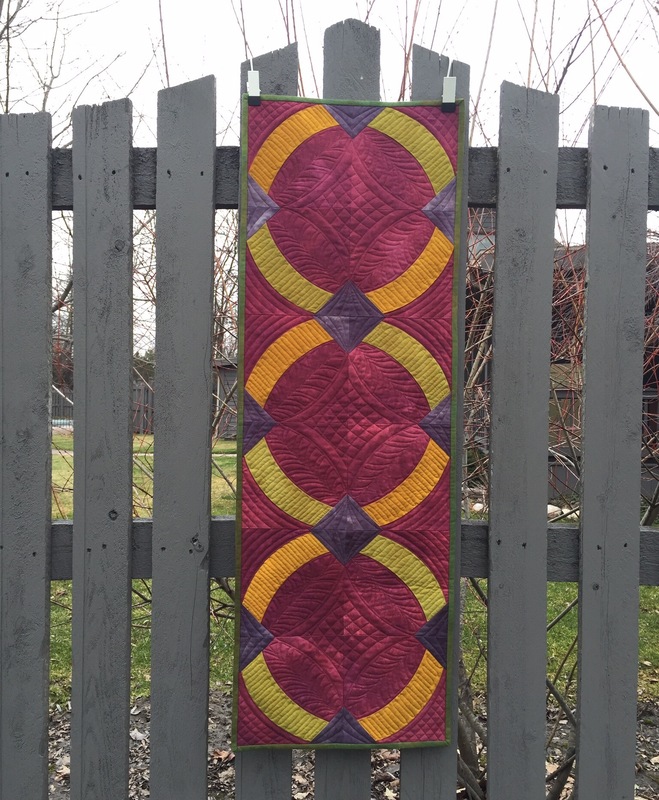 I used the Quick Curve Ruler and Metro Hoops pattern by Sew Kind of Wonderful. I also used their QCR Curvit template for the machine quilting. I used Glide Thread and Pellon 80/20 batting. These pictures taken inside do not show the true colors but I love the way they show off the texture. I did have a few tension issues as you can see on the back. Live and learn! Here it is on my kitchen table. 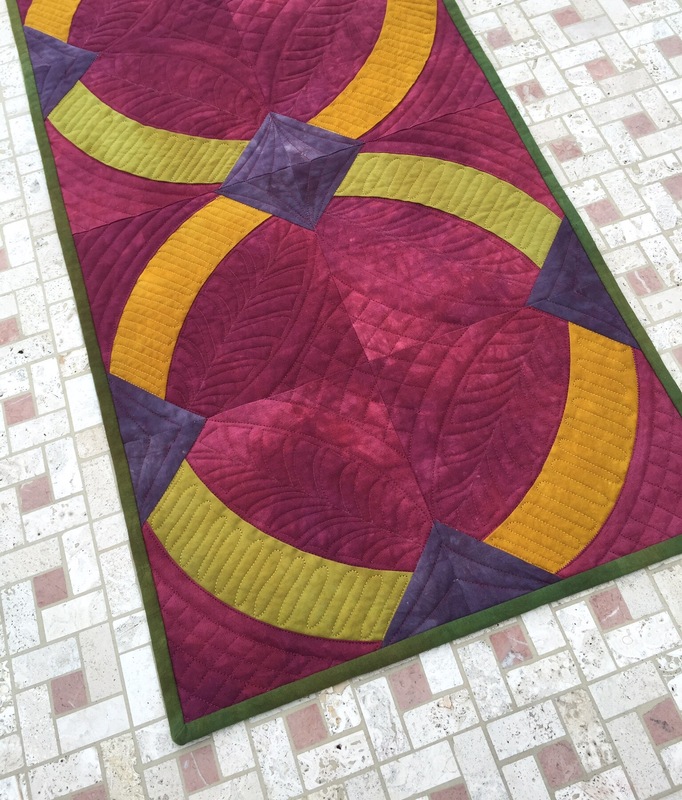 This entry was posted in Crafty Things, Finishes, Free Motion Quilting, Hand Dyed Fabric, Uncategorized. Bookmark the permalink. You’ve done a terrific job! And no one needs to see the back – the front is just too beautiful! Oh. My. It. Is. GORGEOUS!!!!! You have outdone yourself on this one. Great table runner! I’ve been debating jumping on the curve bandwagon. I like this pattern. My guild did a workshop last year with the QCR. I was too chicken to try. Your runner is making me regret that. And your quilting? Wicked good! Thanks for linking up with TGIFF @ A Quarter Inch from the Edge! I love the quilting designs you chose. They compliment the curves so perfectly! I love the colours of the fabric too. Wow ! Wow ! Wow ! Just have to say : gorgeous Katy and great work ! I love it on your table ! This is beautiful! Your quilting is stunning. Great job! Just gorgeous! 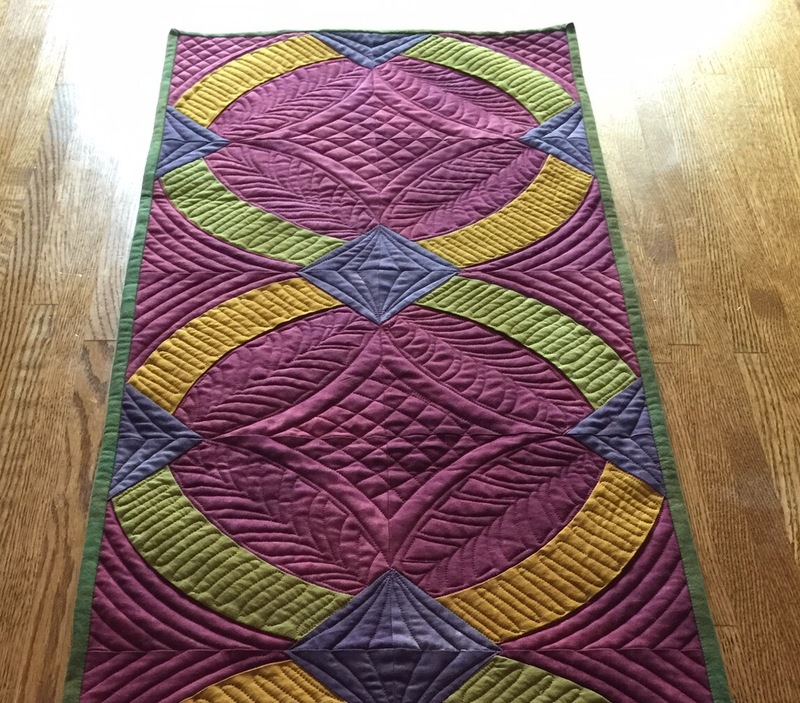 Magnificent job on the quilting! Oh, Katy! The runner is simply beautiful and looks perfect on your table. Your quilting is amazing. Ooh, so pretty Katy! I had to look pretty close to find the tension issue you spoke of…looks fabulous to me, and love those rich colours. This is gorgeous! It looks beautiful on your table. Your quilting is spot on…perfect! Love this and the texture…perfect! 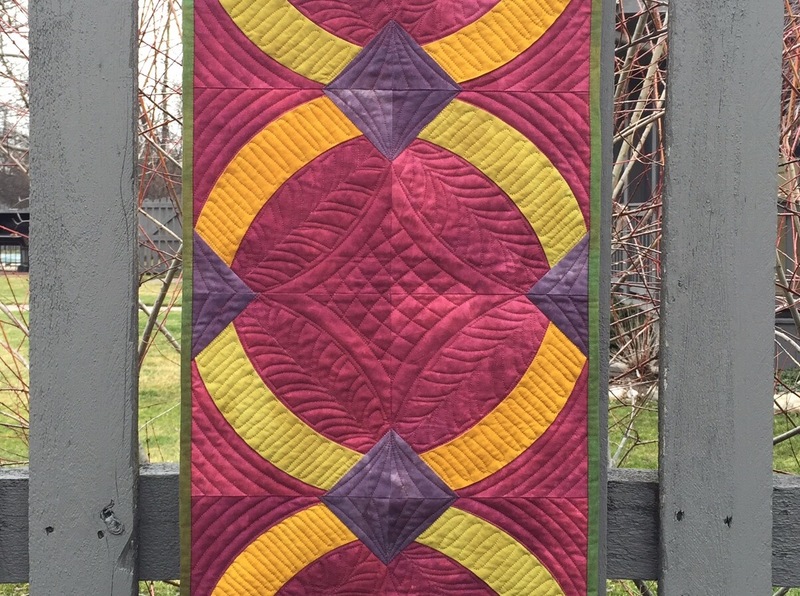 The runner is amazing….love the pattern, colors, and the quilting is just perfect!! It looks great on your table! This is beautiful and I love the texture. 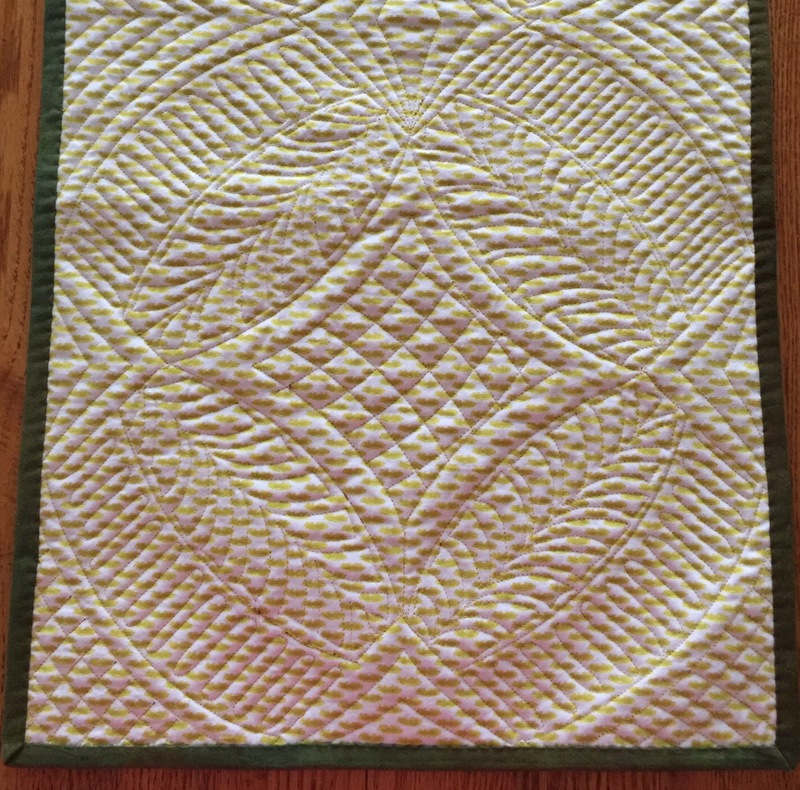 I have a QCR, but don’t know that I want to make all the quilts. Table runners are the perfect solution for me. Thanks for the inspiration! Katy, that runner is just beautiful! The quilting on it is amazing. Such gorgeous saturated color. I am always amazed at how many things you accomplish while somehow making it seem effortless. 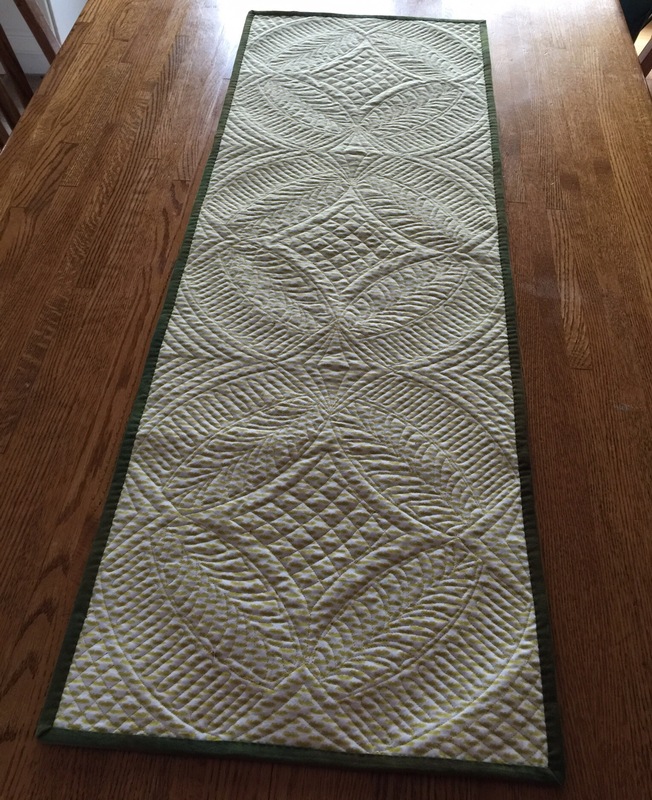 I agree — it’s a gorgeous table runner, and the quilting is really nice! It turned out just wonderful! Perfect quilting for it. 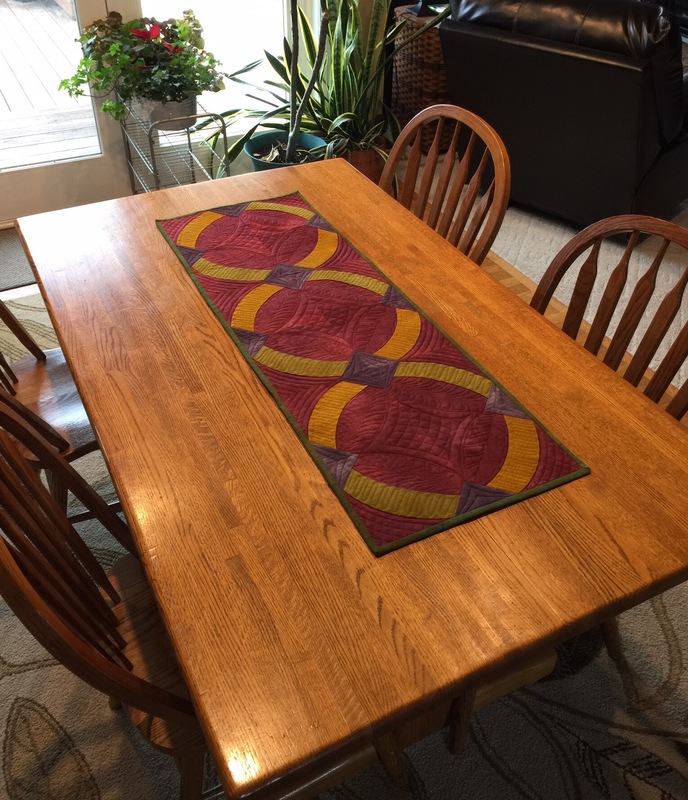 I love the texture your quilting adds to the table runner. And those fabric colors work so well together – very cool! That’s a gorgeous table runner! Color, pattern, and most especially quilting are just wonderful.